Waterworld has a reputation for being a big old belly flop in a world made of water. I think I recorded it out of curiosity than anything else, and I’ve got to say I kind of enjoyed it on a what-the-heck-is-going-on level. Call it a guilty pleasure, but this was ridiculous fun. Costner plays a man known simply as Mariner, in a world where global warming has melted the ice caps and everyone lives on the ocean, dreaming of the myth of dry land and fighting for food, fuel, paper and dirt. Mariner has a mutation though – he’s got gills and webbed feet (it’s unclear if these evolved – which I’m not sure is how evolution works – or were added surgically, but who cares, he’s a merman, and he finds himself lumbered with a woman and child, the latter of which has a map tattooed on her back (which seems to be just an arrow, really), but which makes her a target for one-eyed Dennis Hopper’s evil jetski gang. If what I’ve said doesn’t have you interested, I don’t know what will. All you need to know is the final scene, when Costner, in an airborne craft, needs to save someone in the water below who is about to be set upon by three jetskis all about to converge on one point. Costner ties a rope (not a bungee cord, just an ordinary rope) around himself, hands the other end to someone else and says “Tie this off” before jumping over the side – before the rope has been tied. The people still in the craft manage to tie it, Costner falls perfectly above the person in danger, grabs them and bungees back up again – on the ordinary rope – to safety, causing the three jetskis to collide in a big explosion. Let’s analyse this, shall we? Had Costner not jumped to save the person-in-need, all three jetskis still would have crashed into one another and also the person they were trying to retrieve-and-not-kill. Also, it’s a damn rope. It’s not elastic. I loved how stupid this all was. Just because I only saw one film I need to review this week, doesn’t mean I didn’t cross something off every list I could. The Outlaw Josey Wales is on two of the lists I’m going through (including the 1001 Movies You Must See Before You Die), it was also part of the recommendations list, as Nick Rehak, my fellow French Toastie, picked this as something I should see. It’s also heavily set or based around Missouri and Missourians, so I’m taking it as my Missouri movie for my USA Road Trip over at French Toast Sunday, and it was also amongst the films saved on my TiVo. So yay for me, review coming soon. I still love this movie, and yes it’s still my favourite from 2014 (although I haven’t seen a great deal more from last year that would even get close to knocking it off). This watch (my fourth, as selected by my wonderful girlfriend) got me thinking about the proposed sequel, due in 2018. Spoilers for The Lego Movie, Stranger Than Fiction, The Avengers and Iron Man 3 ahead. In the third act of The Lego Movie, Emmet (wonderfully voiced by Chris Pratt) discovers his world is ruled over by essentially a God, who just so happens to be a child and, ultimately, his father (Will Ferrell), and that all of Emmet’s actions are kind of like Ferrell’s in Stranger Than Fiction, in that they are dictated by the will of another sentient being, and that his free will is merely an illusion. Now, where do they go from here sequel-wise? Do they break free from the world of Bricksburg and head to one of the other Lego worlds like Middle Zealand? Or do they pull an Iron Man 3 and directly reference the events of the previously film, when Tony Stark suffered PTSD from his encounter with aliens and sending a bomb into space via a wormhole? Whatever they decide, I’m looking forward to whatever direction it takes and just seeing what is going to happen. Basically, my most anticipated movie for three years time has already been decided upon. Series 3, Episode 1, 2, 3, 4: We finished Luther this week. Sad times, as now there’s no more Luther to watch. Boo. On the plus side, series 3 is amazing. I loved it. All of it. It’s so tense, with great characters (Alice comes back for a bit, yay!) and some development of ones I hadn’t previously liked, but became genuinely interested in (hello Gray and Schenk) as well as the addition of David O’Hara to the cast as this series’ primary villain. Also, Michael Smiley (pictured). He doesn’t have a lot to do in the show – he’s Benny, the tech guy back at base who can hack anything, and has a background in MMORPG – but I like Michael Smiley, so I’m pleased whenever he shows up. If you’re unfamiliar, he’s cropped up in some Edgar Wright work (he’s Tyres in Spaced and Reverend Green in The World’s End) and Ben Wheatley’s films too. The only question now is, what do I watch next? I think I might track down series 3 of Game of Thrones. Favourite Scene Friday: The French Connection – I took a look at The French Connection‘s infamous car chase as part of To The Escape Hatch’s Oscar-centric month of February. It’s probably my favourite car chase ever, definitely top 3 at least, if only for how insanely it was made. Lambcast #257 2015 Oscar Predictions: I was joined by my co-host Robert, Shane, DJ and David to discuss our Oscar predictions. It’s a little late now, but we still had fun on the show. If you’re bored with all the Oscar talk, just skip to the Rants, Raves and Last Lamb Standing game, which are always fun. This entry was posted in My Week in Movies and tagged Luther, The Lego Movie, The Outlaw Josey Wales, Waterworld by jaycluitt. Bookmark the permalink. 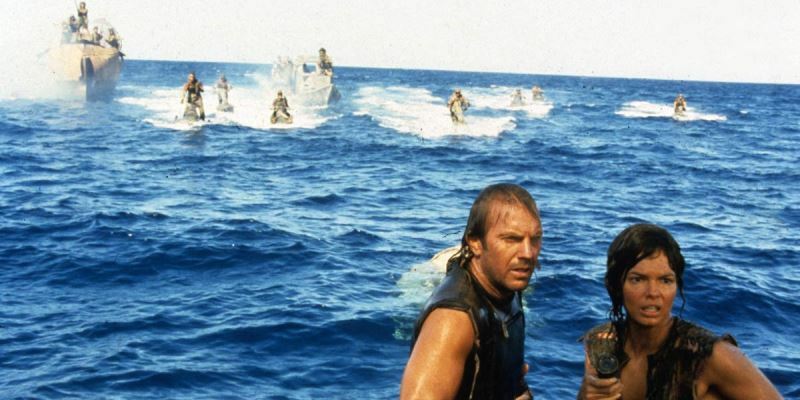 I’ve been hearing how rotten ‘Waterworld’ is ever since the day it came out and I’ve been avoiding it ever since. Maybe I’ll watch it one of these days. Maybe. I will be watching ‘The Outlaw Josey Wales’ as part of my blind spots for this year. ‘The French Connection,’ too. ‘The LEGO Movie’ is not a blind spot for me. I’ve seen it and love it. Great call on that one. Glad you love Lego Movie too. Everyone should. If you do watch Waterworld, don’t expect something stellar, just try and have fun with it. Good luck with Josey Wales, I thought it was great, and I look forward to reading your thoughts on it and the French Connection. Waterworld is definitely not as bad as many make it out to be. It was a troubled production so many people decided it was a failure long before it ever hit the box office. That’s the beauty of not knowing anything about that, I just thought it was written off for being terrible, and was pleasantly surprised with it. Thanks V, I’m glad you liked it too. I don’t think it’s meant to be as funny as it is, but it’s enjoyable regardless of why.